If you go back a year to the beginning of December 2011, Spud never had no interest in Lego what so ever, come Christmas day 2011 and Spud received a very large box of Lego from me as one of his Christmas presents, his love for Lego has not stopped since. 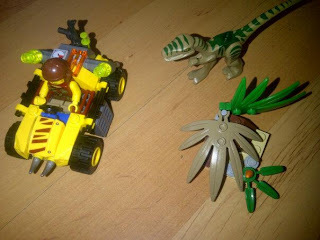 When the lovely PR lady from Lego offered Spud the chance to review a Dino Lego set he was really quite happy, even more chuffed when she offered us a Lego Monster set for review too, you can read that review here. The set contains 80 pieces and is aimed at Children between the ages of 5-12 years. The dinosaur was already made up for us and the rest of the contents came in 2 bags making it easier for us t- build the Lego hero, the car and the plant. 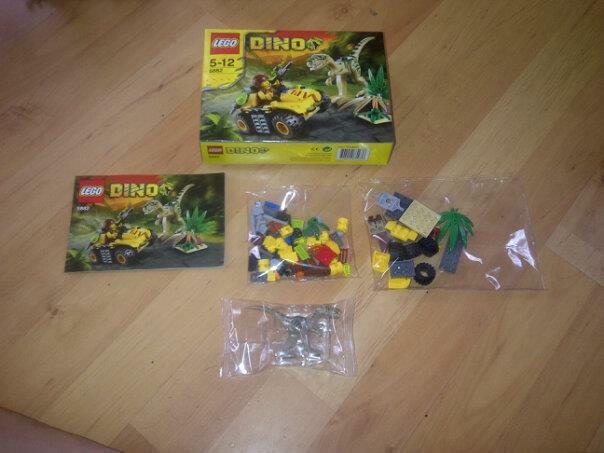 You even get a few spare pieces in case you loose or misplace any of the smaller items. 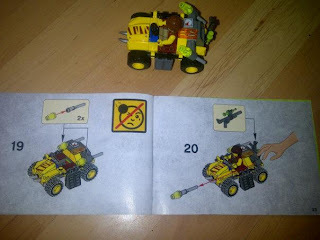 The step by step guided instructions really do help, they are very clear and detailed, Spud helped with a few bits but prefered me to make the set for him whilst he was playing with the dinosaur. Over all the set took me 10 minutes to build much to Spud's delight. The 4 wheeler has 2 flick missiles at the back. I can not recommend this set enough, it's great for any Lego fans and any dinosaur fans! The set is small and affordable too so I recommend this as a great stocking present gift or even a small gift to go with the main present maybe? 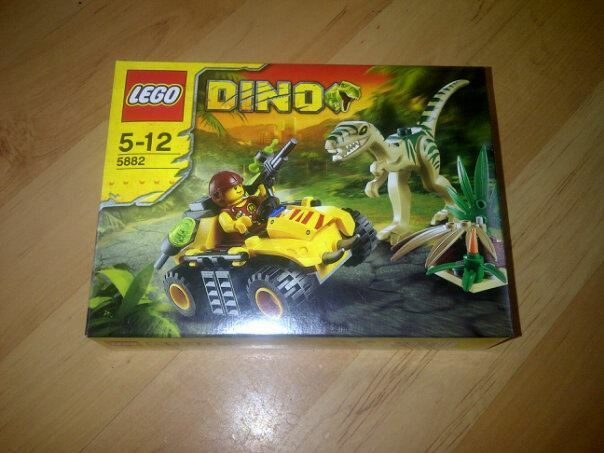 Lego Dino Ambush Attack 5882 is available to buy with a suggested RRP of £8.99 from the official Lego Shop, Toys R Us, Amazon, Asda and many more places. For more information on the Lego Dino range check out the official Lego website here, or follow them on Twitter here. Disclosure - I was sent this product on the basis to review it, I have not received a payment for reviewing this product but instead was compensated as I was aloud to keep the product. All comments and views are of my own/Spud's unless other wise stated and was not influenced in any way shape or form. Two More Great Toys From Fisher Price! The Official Start Of Advent!